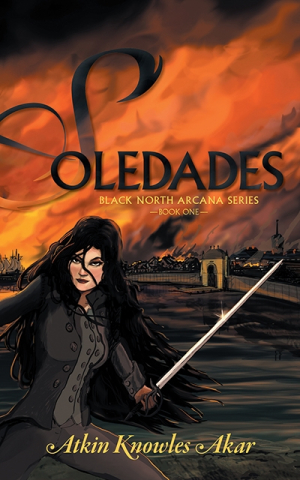 Soledades by Atkin Knowles Akar is an intricate, lush addition to the historical fantasy genre. Vampire Marquaisa has lived some two thousand years, viciously killing and coveting large sums of gold. But it’s never enough. The novel’s beginning finds her vying for stores of gold bars hidden in the French fortress Louisbourg. While a heated political rivalry and subsequent military engagement among England, France, and Spain occurs, Marquaisa works rapaciously to plunder the concealed treasure. Skilled in the art of savage murder, she does so without mercy. Almost divinely untouchable in ability and lifespan, Marquaisa is nevertheless plagued by a mysterious unpaid debt, the terms of which unfold as the novel progresses. It seems her obsessive need to collect gold is not from want, but to settle the terms of an ancient agreement made with a witch; her immortal freedom depends upon it. Will robbing Louisbourg of its gold finally allow Marquaisa to free her soul? The story is populated with a host of dynamic characters, including Leónarre Poisson, scheming regent to King Louis XV of France, and Akuia, the witch who burdened Marquaisa with her debt. Secondary characters are given the same incredible cultivation and development as Marquaisa, a necessary choice in a novel with such a sweeping scope. Though they are plentiful, each character introduced feels natural and integral to the story. The novel moves along at a very diligent pace despite vacillating between a host of different times and places. Never confusing, setting is always well established. Clear, elaborate language wonderfully illustrates Marquaisa’s storied, fateful life. Syntax is rich with detail and sharp imagery. Sometimes passages can be a bit tedious to parse, however, burdened with too much exposition and not enough story. Helpful footnotes guide the story, providing necessary historical and translative context. Defined in the preface as “to be deserted,” the term soledades is a fitting title. While elements of the story will be familiar to those well versed in early American history, the novel’s great success is the exploration of Marquaisa’s character—dynamic, capable, violent, and yet ultimately alone. This paradigm is great fodder for both emotional and analytical exploration. Though this is only book one of the Black North Arcana series, the prospect of more novels set within this universe is exciting. Akar is skilled at both universe-building and long-form writing. Pairing the fantastical with real-world events helps solidly ground the work in a way not often seen in fantasy. Marquaisa’s journey is also quite literary, chronicling loss and isolation with great depth and insight. Wholly absorbing and paced to perfection, Soledades is historical fantasy at its finest.